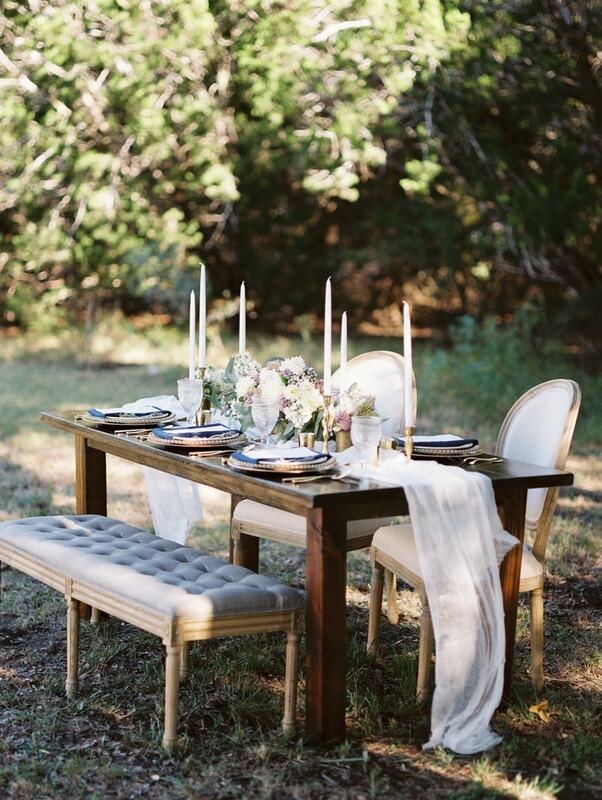 Salado Texas Wedding Inspiration. 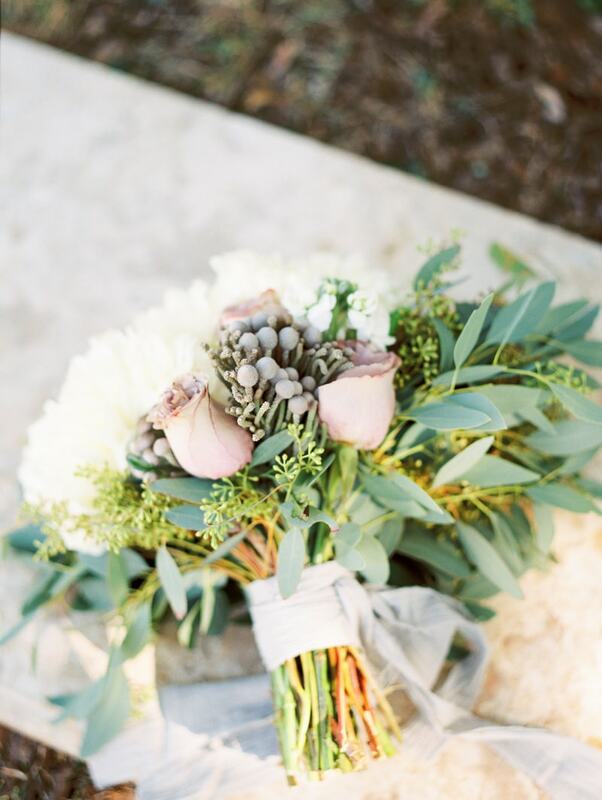 The Chapel at Caliber Oak was the ideal location for this sun-kissed styled shoot in Salado, Texas. This much-adored venue is the perfect canvas to paint a picture of fine art, one that evokes old world charm and sophistication with undertones of Southern elegance. Lavender and royal blue are the hallmark colors for this styled shoot. It all begins with an elegant and modest invitation suite that is simply lovely. 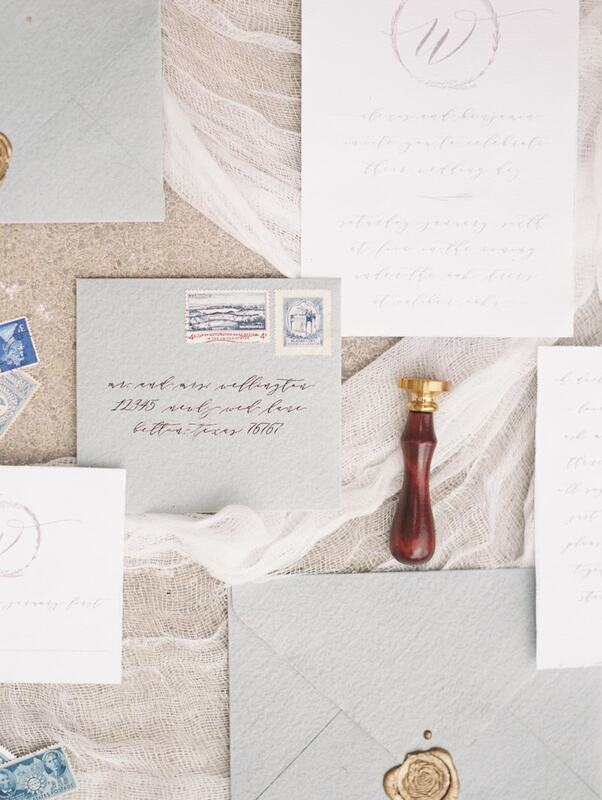 The light blue envelopes, purple script, and gold wax stamp provide the perfect finishing touches. Nothing epitomizes the colors and style of the day quite like the bride’s statement accessory - a pair of velvet royal blue Manolo Blahnik heels with diamond-encrusted embellishments. A beautiful diamond ring, a silk ribbon, and a vintage book are just some of the details included in this shoot. But none can top the stunning detail of the bride’s gown, with its unique neckline and beaded bodice. Lavender roses, brunia berries, eucalyptus and more booms come together for a soft and romantic bridal bouquet, tied with textured ribbons. With her firey red hair and bright eyes, the bride’s makeup is classic and elegant. Her dewy appearance, rose-colored lip and dramatic lashes look impeccable in the gentle afternoon light. Her gown features a stunning open back that’s embellished with appliques and beading, and a long, flowing train. 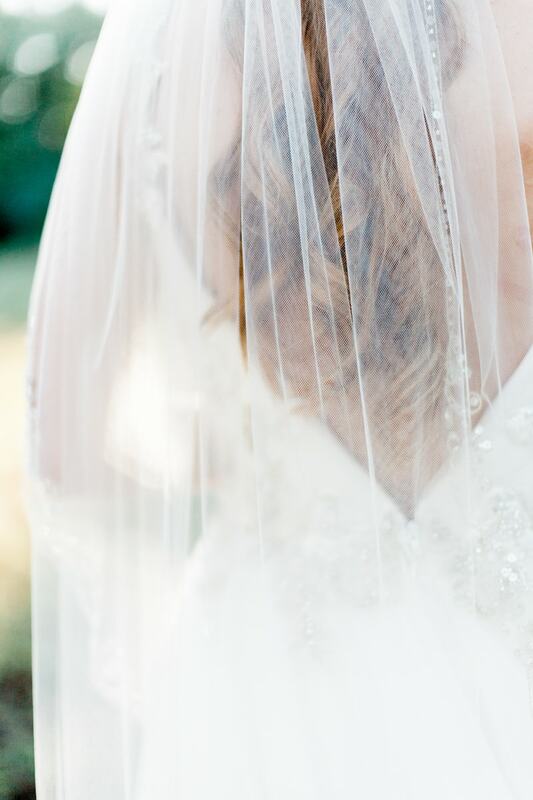 A finger-tip length veil is secured in her half-up hairstyle to bring her entire bridal look together. The Chapel soaks up the sunlight, emitting a gentle brilliance with its white-washed exterior as the trees cast shadows on the entrance. An adorable flower girl brings the charm in a short white dress, floral headpiece, and a petite bunch of lavender. 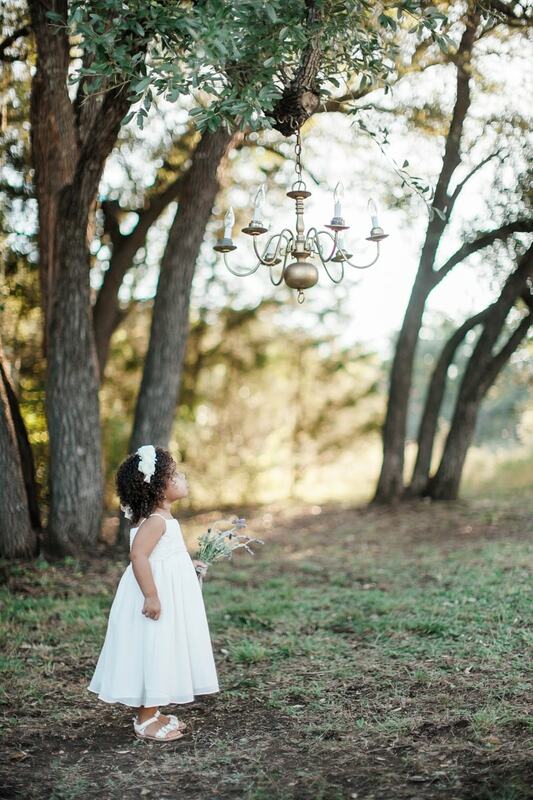 She stands in awe at a chandelier, one of many which hang from a tree branch overlooking the chandeliered bridal courtyard. Textured lavender cheese cloth lay underneath a collection of simple white boutonnieres, all tied with blush-colored ribbons. The impeccable reception table looks nothing short of regal out on the lawn. The natural wooden table features a cheesecloth runner and is paired with both a fabric bench and two high-back chairs for seating. 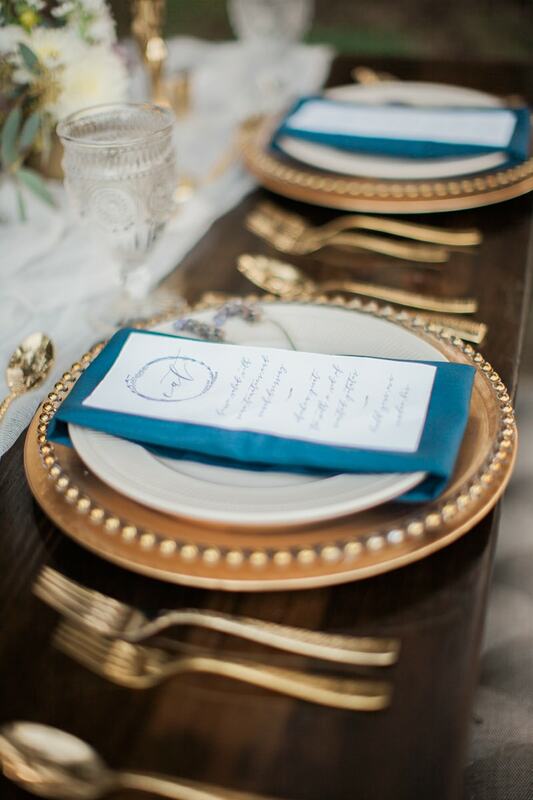 A striking gold charger and matching flatware are presented with a small white plate, a royal blue napkin, and a white menu card at each place setting. And for a sweet finish, a white buttercream cake with a rustic expression features three tiers embellished with lavender sprigs. A fine art-inspired experience is attainable anywhere, especially at the helm of a quaint Texas chapel that echoes rustic elegance. And, the presence of abundant sunlight in this shoot elevates its appeal even further. From the sophisticated décor to the bride’s style, everything was made that much more resplendent by nature’s ambiance.